We went out to meet our horses this morning. 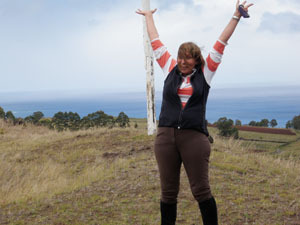 There is a woman here from Zambia (born in England, now living in Africa) - she saw the EnduranceX ad on Endurance.Net - with a ride on Easter Island - and she made it happen. It was a dream of hers to go to Easter Island, since she saw a tv show on the island as a small child. Plus she's involved in endurance riding in Zambia and loves to ride. Zirene said "I had to go, to combine my dream and my passion" . That pretty much says it all! So we show up with riding gear, saddles in tow, to try out our horses. (I was thinking they had already chosen the perfect mounts for us - here, this is your horse, etc...) . So a big group of horses comes running into the yard, herded into the corral. A few hands are there grinning - and somebody says - "go pick your horse"! Yikes! They're milling around, bays, chestnuts, shod, not shod, just horses... I have no idea! I say "I want that one" - a big strong chestnut - and one of the vacqueros says... ah maybe no, very very strong.>Oh great! Well he looked very strong but I think that meant hard to control. So he said, here take this one . I looked at his eye - ok, then looked at his feet - hmmm not too great, barefoot - long toes flaring out , walls sort of busted up. Nope, I don't like his feet. Blank look... and then "ok take this one". Nice looking roany chestnut, and with shoes on his feet. I'm thinking that might be a good thing for this ride, so OK.
We tie him up, and Dinah has loaned me her saddle - a Reactor Panel saddle - with nice big knee rolls, comfy and secure. We put the saddle on him. They hand me the reins - and I noticed they are broken - basically english reins (short) with a broken buckle. Ummm....?? Steve had brought his own reins, so he gave me his horse's headstall with nice longer/intact reins, and he used his. Ok - we ready to take them out for a spin. Zirene has a nice buckskin, seems pretty quiet. I had a real hard time getting my horse to leave the other, he was determined to not go until they did. Hmmm.... but enough clucking and kicking and he seemed to at least move, though reluctantly. We (Steve, Nirene and I) left the yard, onto the dirt road and Steve's horse had a melt down! He started galloping up the road, Steve is such a skilled rider that he stayed with him, deep in the saddle, but I had my heart in my throat, this was not good. He sort of got him under control, somehow back to the stable. I had gone in saying 'he needs a different horse!' I may have looked a bit panicked... but they grabbed his horse's headstall and held the horse for Steve to get off, and gave him another horse! We tried again, and this time it went much better. My horse wanted to canter off, I think he thought that was what he was expected to do. We found a nice grassy area (overlooking the pacific, moai in the background... one almost gets used to it!) and did some circles, stops, trot, walk - figuring out what the horses knew, what we had. Then we went walking through the various moaii heading towards town. Past loose herd of horses - one very macho stallion and his herd, the stallion was dragging a rope. (he showed up later at Pantu's place (the stable) with his little herd in tow - galloping in through the driveway, grabbing a quick drink of water at the corral trough, and then Pantu chased them back out. pests!). Nice leisurely walk, relaxed horses, relaxed riders. 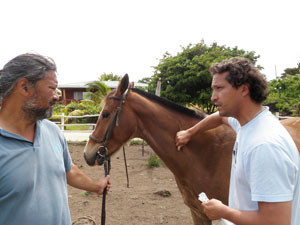 When we got back and unsaddled, a vet was there - researcher from University at Santiago - studying the horses here. Apparently somebody had the great idea to introduce a plant (lupine family) to help stabilize the soil. The plant is toxic to horses - alkaloids - and many of the horses on the island are getting sick. Affects their digestive systems, eventually liver failure. So many of the horses we saw on our drives were thin, listless (they become neurologically compromised as well) with bad coats, gaunt - these were apparently suffering from eating the plants. I just finished lunch, sitting here at a nice little outdoor cafe w good music playing, doing email, uploading a gallery... and - now it's time for the polo game! 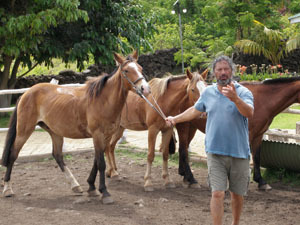 (the first one on the island - should be very interesting to see what these guys can do with the island horses). 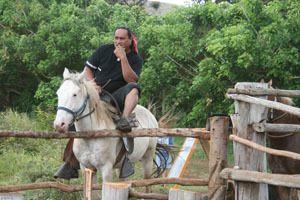 then meeting and party at Pantu's stable this evening. then tomorrow we ride! Love it..."pick your horse." Not exactly the ideal way to start a ride. I think the shoes were a good clue. Guess the island concept of training isn't exactly what most of us around here are used to.